How to get better audio with GoPro? Using a GoPro external mic can greatly enhance your audio recording. Many GoPro users complain about the audio quality produced by their GoPro cameras. Action cameras will not have 100% crisp audio quality especially if you use the waterproof case that will reduce the sound quality to a minimum. If you are not satisfied with the built-in mono microphone then you need to continue reading. I mainly use external microphones when doing live broadcasts or online video calls on Skype since I need to have clear and crisp audio quality. 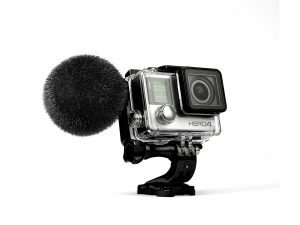 There are many GoPro compatible microphones available for Hero6 Black, Hero5 Black, Hero5 Session, Hero4 Silver, Hero4 Black, Hero3/3+. That’s why I want to show you today what are the best GoPro external mics for 2017. The microphones that I’m going to show you are all recommended by GoPro. Please keep in mind that external microphones cannot be used with the Hero4 session, Hero and Hero+ LCD. The Sennheiser MKE400 is a small shotgun microphone that is great for doing live broadcasts, recording YouTube videos or having video calls. It works for both GoPro and DSLR cameras. It’s designed to reduce noise thanks to its foam windshield, wind noise filter and integral shock-mount. It has a metal housing that will make it rugged and solid. This microphone is powered by one AAA battery that can last for up to 300 hours. Frequency response is 40-20000 Hz. I personally have one that I use for my broadcast sessions and I can say that I’m very satisfied with its quality. Similar to the MKE400, the Rode VideoMic is a professional shotgun condenser microphone designed to be used with both DSLR and action cameras. I use this one with my DSLR camera when using it as a webcam. This one has a high quality shock mounting design that isolates the microphone from its shoe mount and provides isolation from unwanted vibrations. I had zero noise recorded from handling and waving around with the camera. They did a pretty good job at designing this mic. The sound is crisp and full. Frequency response is 40-20000 Hz. It’s powered with a 9V alkaline or lithium battery So if you’re looking into getting an affordable shotgun microphone then look no further. Another good shotgun microphone is the Opteka VM-100. It is a highly sensitive directional microphone with noise reduction capabilities like the NRS system (Noise Reduction Suspension) and the windscreen. You will get two windscreens in the box, one for indoor use and the other for outdoor use with more noise cancellation features. It’s powered with a 9V lithium or Alkaline battery and can last for up to 100 hours. It can be attached to SLR cameras. It’s cheaper than the MKE400 but of course doesn’t have the same sound quality. If you don’t like the bulky looking mics and prefer to have a small microphone for your GoPro then look no further. The Comica CVM-VG05 is the right choice, it’s a “convenient” mic that attaches directly to your GoPro. It’s best used for interviews and POVs, didn’t test it in windy conditions but I know that the kit includes a windshield filter to reduce wind noise when used outdoors. It might not have the same quality of the above Rodeo and Opteka mics but if you’re looking for a compact and cheap GoPro microphone then the Comica mic would be your best choice! I don’t know if you are familiar with this type of microphones. Well for me I wasn’t until I tried this SP-TFB-2 from Sound Professionals. This is an In-Ear binaural microphone that has in-ear holders that slip into your ears. Weird I know, but they claim that it has the most realistic recording. Also your hearing will not impaired while recording so you can enjoy recording without any issues. This mic has windscreens on both ear holders. It can also take additional battery power. Frequency response is 20-20000 Hz. A very small hands free microphone with a clip that can be attached to your clothes. It can rotate for flexible placement and doesn’t need any batteries, it has plug-in power. This is a good option if you don’t require any high quality recording or noise cancellation capabilities. Another great alternative is the Polar Pro Promic For GoPro. 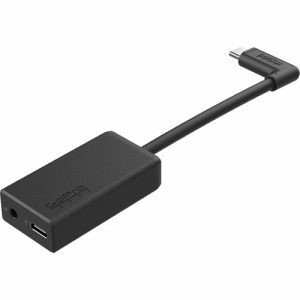 In order to connect a GoPro to an external microphone, a Mini USB to 3.5mm jack adapter is required. Since the GoPro doesn’t have an audio input but only a MicroUSB port. This is a small inexpensive adapter that you need to get if you want to use external mics. I recommend you to get the GoPro adapter and not a third party one since some of them have poor quality and can impact your audio input. Check it here. For the Hero5 Black/Session and Hero6, you would need the new GoPro USB-C 3.5mm mic adapter as the mini-USB mic adapter that was used in Hero4 cameras does not work on the Hero5. The GoPro Hero3/4 Frame is a must have for audio recording and charging your GoPro while it’s fixed on a mount. It exposes the USB, HDMI and SD card slot ports. With this frame, you will be able to keep your GoPro charged while recording, it also enables you to have better audio quality from the builtin mics since it doesn’t soundproof the sounds unlike the waterproof case. GoPro recommends the below microphones for the Hero4 Black, Hero5 Black and Hero6 Black. They are not compatible with any other model, so be careful when ordering your mic. The mics that I’m going to show you are pro mics and they really provide high quality sounds, so if you’re not happy with the audio produced by your GoPro Hero4/Hero5 Black then you might want to consider adding an external microphone to enhance the sound quality whether you are planning to take footage of yourself playing guitar or maybe just singing. You cannot go wrong with these ones! 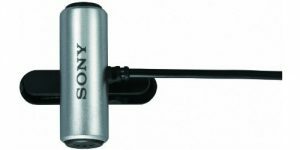 The microphones that I’m going to show you below use an XLR connector and not a 3.5mm jack like the above mics since these are PRO mics. So in order to connect them to your GoPro, you will need to get an XLR to USB adapter. I use the one from SHURE. I think you are familiar with the SHURE brand when talking about microphones. The SM57 is mainly an instrument mic, it is versatile and rugged. It picks up clear and bright sounds while minimizing background noise. It’s highly reliable and diverse. You can use it with anything whether playing an instrument or doing a performance. The brand SHURE speaks for itself. A competitor to Shure is the Sennheiser brand. Another great and popular brand in the music world. The MD421 is Sennheiser’s most popular dynamic mic. It’s great for recording guitar and drums thanks to its full bodied cardioid pattern and five-position bass control. It’s also used for broadcasts and singing. Frequency response is 30-17000 Hz. Another great mic from Shure. The SM58 is the number one mic when it comes to recording vocals. It’s legendary and used everywhere. It’s rugged and very well designed to help minimize breath pop noise and background noise thanks to its high quality built-in filter. Frequency response is 50-15000 Hz. The Shure SM7B is a super high quality mic designed for vocals and used mainly in radio and TV. It has many great features and design. Another excellent product from SHURE. This retro looking microphone is also recommended by GoPro. The ElectroVoice RE20 is a pro microphone with a heavy duty internal pop filter that reduces proximity effects and wind noise. Contrary to its looks, this mic uses the latest technology for the best sound quality.It has many positive reviews on Amazon. The Sennheiser MKE 2 Elements is the recommended microphone by GoPro for Hero4 Black and Silver and the solution we were all waiting for, a waterproof microphone we can use outdoors in wet conditions, whether I’m mountain biking, water rafting or kite surfing, I can now capture awesome video and audio without having to worry about the external mic getting wet or recording low quality audio from GoPro’s built in mic. The Sennheiser MKE 2 Elements is rugged, very well sealed and can go underwater without any issues. But how does it do it? Well, the Sennheiser MKE 2 mic is designed as a BacPac that attaches to the GoPro case. If you are looking to improve the sound quality of your GoPro videos then you might want to consider adding an external microphone, you won’t believe the difference it makes specially with a high quality mic. If you play an instrument, sing, shoot broadcasts or just want a better audio quality then I would personally advise to try an external mic. You will love it! Hello Michel! so i have some troubles with my gopro hero 5. I wanted to record electric guitar but the original gopro’s microphone had really lack of quality so i got my self shure sm57 and shure X2U adaptor. But like when i connect mic to laptop all the lights on shure x2u turns on and u see that its actually working , but when i conect it to my gopro the shure x2u doesnt seem working and the videos are being recorded still with integrated gopro mic. Any thoughts how to corectly connect everything together and start up gopro using external mic ? Hi Michel! Very informative review, thank you. Could you please recommend one mic for recording of rock band gigs in very loud condition and at short distance? We are using currently Zoom H2n connected to GP4 but looking for alternative. Hi Erik, apologies for replying so late, I might have missed your comment 🙁 I would suggest the TASCAM-DR40 digital recorder. It’s a high quality recorder and suitable for your set up, works well with loud conditions as well. Check it out. Hi Michel, very good review and really open world of mics for GoPro. Could you please recommend me one good for rock band gigging for using in a very loud condition at close distance? Currently we are using Zoom H2 but looking for alternative. Thank you. Thanks for writing this review on the GoPro external microphones. I’ve seen the GoPro camera in use quite a few times. However, had no idea that the waterproof case distorts the audio quality. How much does the sound quality differ from one external microphone to another? What’s your favorite external microphone? I’ve been looking at GoPros for doing podcasts, webinars and the like and am right at the start of that journey. Sound quality is something that has worried me a lot, so this article really helps assure me that good quality sound is possible, and even bettter makes some informed suggestions as to how – Excellent. Do you have a recommendation for a GoPro/mic combination, mid-priced that would give me reasonable vvideo and excellent sound quality for podcast, webinars, information videos (not pro but amateur)? Thanks for taking the time to compile this list of recommendations. Wonderful information, I really like the idea on having an extra microphone to improve the sound quality on the GoPro. I’m very interested in Polar pro promic so I’m thinking of getting one to my friend who is having a studio for music performance and he is a qualified master of ceremony and he needs enough equipment so that the business can go through properly. Exactly Jose, having a GoPro external mic will definitely help your friend get the best of quality from his GoPro camera during his performances and to help him in his studio. But the Polar pro mic might not be the best option for studio recording. You would need a higher quality mic like the Shure SM57 or the Sennheiser MD421. Let me know if you have any questions. Useful resource. Which mic would you personally recommend? It would be useful to know the price of each of these, so we can easily compare those within our own price range. Is this something you could add? Hey David, I would personally recommend the Rode VideoMic but it also depends for what are you going to use the mic for. Oh Wow! This is a great post. I’m an avid camper and part time hiker, so a camera is definitely something I can benefit from while I record my adventures. But the microphones you have outlined is a must-have for any GoPro. This is a well-thought out post so I thank you for that 🙂 The Sony ECMCS3 looks like the best one to fit my needs. Indeed the microphones are as must have if you’re looking for the best audio quality for your GoPro videos. The Sony ECMCS3 is a good choice for live broadcasts or interviews. Lots of great ideas for microphones here. I learned a lot. I have the Røde VideoMic myself and love it. When I’m not using it with my GoPro I use it on my Canon 70D too which I use for filming. I have also bought a dead cat windshield for filming in windy condition which works great. Glad you enjoyed my article! I too have the Rode VideoMic and very impressed with its quality. I haven’t tried it on my DSLR yet but I should, as I mainly use my GoPro a lot more. Of course having a windshield is a must in windy conditions! I’ve been using Sennheissers for years and SM58’s are classic vocal microphones. Used them lots. Mind you I wouldn’t be sticking them to my Go-Pro especially as they’re bigger and heavier. They’re not really designed for the sort of activity I would normally associate with a GoPro. 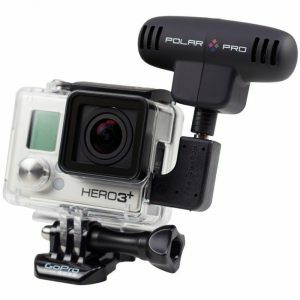 i see the picture of the GoPro has a Polar Pro attached. That looks more practical. Is it a GoPro brand? Shure and Seinnheiser are top brands when it comes to microphones, indeed the SM58 is a very well known vocal mic that is used everwhere. Of course, it’s not possible to stick the microphone to the GoPro, it should be held by hand or attached to a stand. The polar pro is a mic brand and I will talk about it and add it to my post in the coming days. I hadn’t really taken a lot of notice of the audio quality of my GoPro, but now that you mention it – a high quality mic on a GoPro could make a big difference in some circumstances. I look forward to your Polar Pro post. The mics on the GoPro are not the best hence affecting the audio quality of your videos. Using a GoPro external microphone can greatly improve the sounds of the GoPro videos especially when doing live broadcasts or performance. I have ordered my Polar Pro mic and I will add my review as soon as I receive the mic. I perform music at venues around the city I live in. I find you cant go wrong with the Shure SM-58. They are rock solid and I have never had any problems. I would like to get a go pro in the near future and will take into consideration this article when it comes to getting the best sound quality. I can’t but agree with you on the Shure SM58 mic! It’s a very high quality and rugged microphone. It’s used mainly everwhere. You van’t go wrong with Shure mics! If you’re thinking of getting a GoPro then you might want to also check my article on comparing different Hero 4 models. Why dosent the Shure adapter working whit GOPRO Hero 4 Silver? Or do you have any suggestions of a microphone to the Silver? I want to buy a camera to have with me when I am diving and also when i am working with conserts. Hi Robin, which Shure adapter are you talking about? can you be more specific? Can you use shure sm57 on go pro 4 silver ? Is Rode Good on concerts? as I mentioned in my post. Do you use an usb cable from adapter to the hero 4 silver? Great reviews , thanks for sharing this information . It amazes me how technology is taking over our lives for the better. I’ll make sure to come back and check more interesting reviews on more products. Very informative. I have to bookmark your site because I have yet to record any videos because I have no knowledge of the tools needed for sound and picture quality. Especially because I may not always be able to record from anywhere but my phone or Ipad. Thanks for the info. I record Podcasts all over central west London recording straight in to my mac. I use a presonus audio USB straight in to the mac with two mics connected. What I really want is a mic like the ones news reporters carry around with them. Smash the SD card in the socket, press record and I’m good to go. Hi John, very interesting idea! The problem is that this kind of mics doesn’t exist yet. What you would need is a recorder. There are many good quality digital recorders out there. I would personally advise you to get the one from ZOOM. I records directly to SD and SDHC cards and it has an XLR input so you can connect your microphone directly to it and start recording! I have been doing a lot of research on microphones lately and have heard many good things about Rode Mics. I may have to give them a go and see how it works out. Good audio is key for any recording.